Since Andrew Wheeler was sworn as EPA's second in command on April 20, the lobbying veteran has had at least three meetings with former clients that may have violated the Trump administration's ethics pledge and other promises he made to steer clear of potential conflicts of interest. 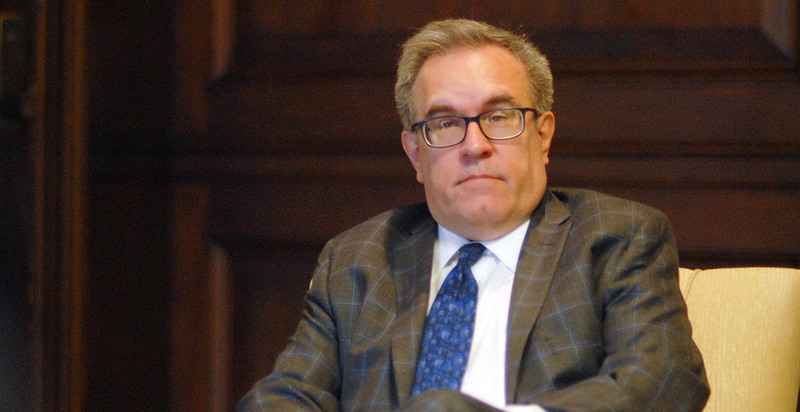 Wheeler — who became acting administrator after Scott Pruitt's July 6 resignation — has also attended other events that prominently included the head of a company he is currently prohibited from getting involved with, according to an E&E News review of public documents. The string of ethically questionable encounters stand in stark contrast to the acting EPA chief's claims that he is taking pains to avoid helping his former clients advance their interests. "If I lobbied on something, I don't think it's appropriate for me to participate," Wheeler told Bloomberg News on June 27. But the day before that interview, Wheeler's public calendar shows he participated in a "stakeholder meeting" with Darling Ingredients, a former client. The biodiesel producer paid Faegre Baker Daniels Consulting more than $1.4 million over nine years for Wheeler and the firm's other lobbyists to push changes to the renewable fuel standard as well as renewable diesel and biodiesel tax incentives, according to lobbying disclosures compiled by ProPublica. Darling — which Faegre identified in disclosures as Darling International, the company's previous name — paid Faegre more for lobbying than any of Wheeler's other lobbying clients, except for coal company Murray Energy Corp. Which Darling representatives Wheeler met and what they discussed isn't clear from his public calendar. Darling and EPA didn't provide any additional details, and the agency hasn't responded to any of the Freedom of Information Act requests from E&E News for Wheeler's more detailed personal calendar. But the Irving, Texas-based company has been strongly advocating for EPA to expand the annual amounts of biomass-based diesel that refiners or importers of petroleum-based diesel must use as part of the renewable fuels standard, or RFS. Wheeler will now have the final say on those volumes. During his time as Pruitt's deputy, Wheeler's public calendar shows he had other so-called stakeholder meetings with agribusiness giant Archer Daniels Midland Co. (ADM), which Wheeler's October 2017 financial disclosure report notes paid his former firm more than $5,000 sometime between 2015 and last August for the current EPA chief's "strategic advice and consulting," and the South Coast Air Quality Management District (SCAQMD), a Southern California regulatory agency that paid Faegre at least $600,000 for lobbying between 2010 and 2012. Those meetings occurred even though Wheeler promised to avoid his former clients until April 20, 2020, or only meet with them in large settings. "I will not for a period of two years from the date of my appointment participate in any particular matter involving specific parties that is directly and substantially related to my former employer or former clients," says the Trump ethics pledge Wheeler signed upon taking office. It's possible that the meetings with former clients weren't about a "particular matter" that Wheeler previously worked on for them. But that's difficult to determine from the public calendars, and EPA didn't provide additional information about the focus of the events. The June 28 Darling meeting in particular may have violated another clause of the Trump ethics pledge, as well. It requires former lobbyists like Wheeler also not to participate "in any particular matter on which I lobbied within the 2 years before the date of my appointment or participate in the specific issue area in which that particular matter falls." Yet Faegre filed a termination report for Wheeler's lobbying work with Darling on May 31, 2016, less than 24 months before he was sworn in at EPA. The focus of the Archer Daniels Midland meeting was "an RFS discussion," spokeswoman Jackie Anderson said in an email. "This is the first time we discussed EPA-related issues with Mr. Wheeler." She also said that ADM's "previous work with Mr. Wheeler was several years ago around un-related food-issues." In public comments, ADM has been pressing EPA to reduce the number of RFS waivers granted to small refineries and consider allowing more advanced and cellulosic biofuels to be used in the program. Earlier this week, Wheeler approved the use of sorghum oil as a feedstock for renewable fuels (E&E Daily, July 25). Meanwhile, SCAQMD, which Wheeler only lobbied for in 2010, has its own issues to work out with EPA. For example, the air pollution agency is currently asking the U.S. Court of Appeals for the District of Columbia Circuit to rehear its challenge to EPA's implementation of the 2008 ozone standard. The court previously rejected SCAQMD's argument that changes in the rule made it harder for areas like Southern California's Coachella Valley — where air pollution drifts in from upwind areas — to show progress in achieving the standard (Greenwire, April 24). That lawsuit didn't come up in SCAQMD Executive Officer Wayne Nastri's meeting with Wheeler, according to spokesman Sam Atwood. "The topic of their discussion was SCAQMD's petition to US EPA to begin rulemaking for a new nationwide low-[nitrogen oxide] standard for heavy-duty trucks," Atwood added. "This proposed standard is a critical tool needed to bring our region into attainment with federally mandated air quality standards. It is supported by a broad coalition of local regulators and others, as it would provide significant air quality and economic benefits to many regions across the county." The full guest list for Wheeler's meetings with former clients, which EPA also declined to provide, is another factor needed to determine if they were ethically sound. That's because in a separate EPA recusal statement Wheeler endorsed on May 24, he acknowledged, "If my former employer or a former client is present, then I understand that, generally speaking, at least four other parties should be present to ensure that a diversity of viewpoints is represented and not the same united perspective." No other parties are listed in Wheeler's public calendar for the Darling and SCAQMD meetings. The discussion with ADM, which occurred on the same day he signed the recusal, included only two additional ethanol producers, POET LLC and Green Plains Inc., not the "four other parties" suggested by the recusal. Nevertheless, EPA argued that Wheeler's meetings with Darling, ADM and SCAQMD were all permissible because the former clients weren't included on his recusal statement. "Therefore, none of these entities presents any pledge issue for Mr. Wheeler," an agency spokesman said. Lobbying experts, however, disagreed with the agency's interpretation of the Trump ethics pledge and questioned the usefulness of EPA's recusal statement. "Andrew Wheeler is just playing it loose here," said Craig Holman, a lobbyist for the consumer advocacy group Public Citizen. "He is not supposed to be working with any of his former clients." Meetings with former clients could cast doubt on Wheeler's decisions at EPA, according to Thomas Susman, a former lobbyist who edits "The Lobbying Manual," a guide to lobbying law and practice. "The question in these revolving-door issues is, is he going to do [something] because he has come to see only one side of the issue?" he said. "Another possible problem is trying to basically come across in a favorable light for future employment opportunities. And a third problem is the appearance to the public." Referring to the EPA chief directly, Susman said, "his past financial benefit and issue orientation based on his advocacy for the client are going to, it seems to me, provide an appearance of being unable to be neutral and represent the public, which he's paid by taxpayer dollars to do." The perception of a conflict? Meanwhile, other gatherings Wheeler attended as deputy administrator could have violated the spirit of his recusal agreement, which specifically prohibits him "from participating in any particular matter involving" International Paper Co. and seven other former clients until April 2020. The paper giant is responsible for several toxic waste sites around the country and has set aside $128 million to fund their cleanups. Three of those sites — including the San Jacinto River Waste Pits Superfund site damaged by Hurricane Harvey — could have "material" impacts on the International Paper's bottom line, the company said in its most recent annual report. 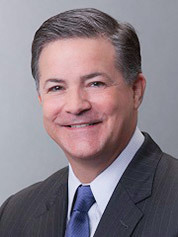 While Wheeler hasn't met directly with International Paper, he has attended events where Mark Sutton, the chairman and CEO of the world's biggest papermaker, played a prominent role. On June 6, Wheeler's public calendar shows he delivered remarks to the Business Roundtable's Energy & Environment Committee, which is led by Sutton. Then on June 28, he spoke at a meeting of the American Forest & Paper Association's board of directors, on which Sutton is the second vice chairman. The following day, he had a "stakeholder meeting" with the same forest products trade association and another group. EPA and International Paper both noted that Sutton wasn't at the June 29 meeting. Even if he had been, though, Wheeler would have been in the clear, according to the agency. "The meetings were not in fact one-on-one meetings with International Paper as a specific party," the EPA spokesman said. "Rather, as the calendar clearly indicates, these were meetings with or remarks given to organizations that were attended by more than a handful of attendees, including Mr. Sutton." The Business Roundtable committee meeting Sutton led "consisted of a broad update on EPA's agenda and priorities," International Paper spokesman Tom Ryan added. "No company specific issues were raised at any time." Still, Holman thinks questions about Wheeler's interactions with his roster of nearly a dozen publicly disclosed former clients were inevitable. "As soon as he stepped into the EPA, he was a conflict of interest," the Public Citizen lobbyist said. In the end, whether or not Wheeler is strictly abiding by the letter of his ethics promises may be beside the point to the general public, according to Susman. Voters elected President Trump so he would drain Washington's ethical swamp, not reinforce it. "There are things that you shouldn't do that may be legal," he said. The Darling meeting in particular "would certainly come close to if not be over the line for someone to be involved with a firm that was paid a large amount of money from a client and then go into government and meet with that client on matters of interest to the agency," Susman said. Reporters Mike Soraghan and Kevin Bogardus contributed. Clarification: This story was updated July 27 to make clear that Andrew Wheeler's Office of Government Ethics financial disclosure report shows Archer Daniels Midland could have paid him anytime between Jan. 1, 2015, and Aug. 12, 2017, when he signed off on the report. ADM suggested the work he was compensated for occurred sometime in 2015.